Dog friendly! This cottage was built in 1882 for the portrait artist who came to Anniston to paint the portraits of the town founder, Samuel Noble's, family. It is called the Artist Cottage. The cottage features two bedrooms, a bath, laundry room, living room with fireplace, and an updated and spacious kitchen. Lovely furnishings, some antiques, and all tastefully decorated, this cottage is both comfortable and charming. With two porches, both front and back, there are lovely views. The front porch looks out to the tennis court. Located on the 20 acres of woods and gardens of the very historic Springwood Inn, the cottage features true privacy and wonderful tranquility. 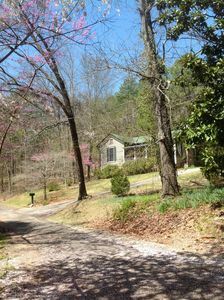 Drive back the long, private driveway to this cottage and you can't help but feel that you have made the right choice! 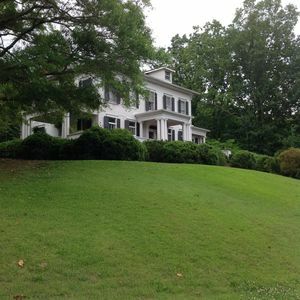 If Talladega nights are available, they are priced at $300 per night with a 2 night minimum stay..